Electrical fires are something every homeowner wants to avoid. Unfortunately, there are many electrical issues that can happen when homeowners are not paying attention to how they utilize and maintain electrical devices and components in their home. Examples of these devices are your washer/dryer, fridge, pool or hot tub, your mobile and portable devices as well as other electrical components in your home such as your electrical wiring. It is important to recognize any bad habits that could cause electrical hazards in your home and work towards correcting them. We understand that some things become such a part of our everyday life that we forget that they could be hazardous, or the thought of it being hazardous has never crossed our minds. Here are some of the most common electrical hazards. It may seem like you’re protecting yourself by connecting multiple surge protectors together in order to boost the protection level your household appliances have, but this does not work. It’s extremely dangerous and is more likely to contribute to a power surge or an electrical fire in your home. All electrical cables should be properly insulated according to local regulation, but that does not mean you should have cables lying around your home. Electrical cables are not only a tripping hazard, but you can forcefully disconnect your cable from the power outlet. Repeated forced disconnections can fray the wiring or damage the plug outlet. Loose cables are also considered pet hazards, as your furry or feathered companion may decide it looks like a great chew toy. If you’re lucky, your pet will only fray your wiring but if you’re not your pet can be exposed to an electrical shock. It may seem like a weird one, but neglected appliances can cause electrical shortages or even electrical fires. For example, many homeowners forget to clear out the lint in their dryers, but this is one of the leading causes of home fires. Make sure that your electrical appliances receive proper maintenance, even if it’s just as simple as cleaning out the lint from your dryer. As much as we want to plug in everything we own at the same time, using multiple power strips to do so is dangerous. 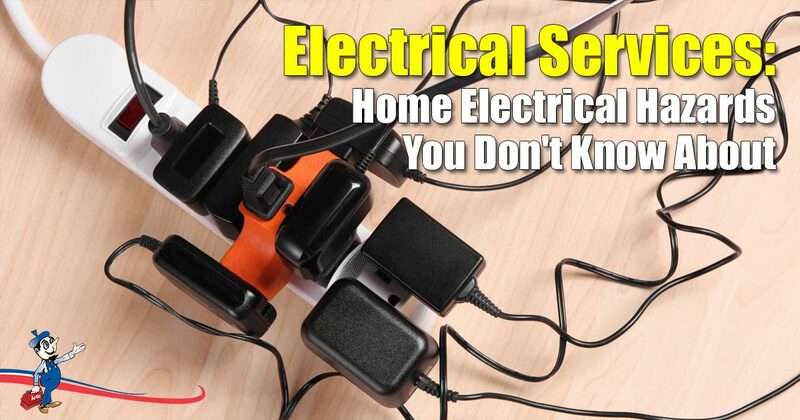 It will cause electrical issues in your home as you’ll have overloaded your household electrical circuit. Remember that each outlet and power strip has been specifically designed to handle a certain amount of electrical current. You should not overload its capacity. If you’re lucky, you will only experience an electrical surge which can cause some of your appliances to fuse, but if you’re unlucky, it will cause an electrical fire. For electrical outlet installation to increase the number of outlets in your home, speak to one of our licensed electricians to get the job done. At Art Plumbing, AC & Electric we provide a wide variety of residential and commercial electrical services, to meet your every possible electrical need. If you have children at home, it’s important to ensure that your outlets are covered. Little inquisitive minds are always curious about new things and your children may decide to poke and prod at the holes in the wall. Your children are at risk of being electrocuted should they stick anything into the outlets in your home – make sure you have them covered. Many of these electrical hazards are things that homeowners take for granted because they’ve been lucky enough to never experience the dangerous outcomes. It’s important to take basic precautions to avoid having to deal with costly repairs caused by an electrical surge, shortage or fire. If you’d like to ensure that your household electrical circuit is performing effectively and safely, contact the friendly team at Art Plumbing, AC & Electric to find out more about the range of electrical services we offer.